Meera, Georgina and Marni accept their award. 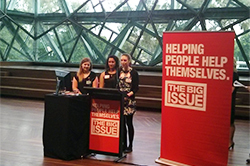 In 2013, La Trobe's 'Revegetate' team – Meera Dawson, Georgina Wheeler, and Marni Chaskiel– won The Big Idea national competition. Revegetate's idea and business plan provides work for Melbourne's disadvantaged and unemployed through an urban landscaping project – selling living vertical walls to cafes, hotels and restaurants throughout the metropolitan region. Aided by our Business School's Rylan Gan – a mentor who volunteered his time to the team – the team went on to take out the top spot in the National Finals on December 2, 2013. The judging panel for the finals included high profile executives like Steven Persson, CEO of The Big Issue, Natasha Stott Despoja, former leader of the Australian Democrats and Andrew Penn, Telstra CFO. 'The La Trobe team's entry stood out for its innovative concept and faultless business plan, which went into great detail to research customer, market and target audience,' said Sally Hines, The Big Issue Enterprise and Community Engagement National Manager. In early November, 13 student teams from across La Trobe's campuses competed in front of a panel of five judges from universities, charities and businesses. 47 students were challenged to develop a concept for a social enterprise – an organisation that addresses social disadvantage without relying on government or philanthropic handouts. Teams were judged on the social impact of their idea, its viability as a business and whether it would have the capacity to grow. The judges and audience members were thoroughly impressed with the creative ideas from each team, ranging from employment pathways for disadvantaged youth to a unique laundry service, recycled furniture, cultural cafes and regional hygiene services.